When you think about changing colors, the word ‘chameleon’ usually comes to mind. But there are other animals which can change their colors – the mimic octopus is the most noteworthy example, and there’s also the fish that mimics the mimic octopus. Now, researchers have found yet another fish which can change its color – the simple rock goby. The rock goby can change its skin coloring within a minute to blend in with its environmen and avoid predation, a new study found. Image credits: BAS KERS (NL)/FLICKR (CC BY-NC-SA 2.0. Rock gobies, which can reach about 12 centimeters long, are found in intertidal pools in some areas in Europe and Northern Africa. Anecdotal evidence has long supported that they can change their colors, but until now, there has been no serious study to document this. The new research, which was published in PLoS ONE shows that not only can these fish change colors – but they do it fast, in less than a minute. Martin Stevens and colleagues at the University of Exeter in Penryn, England, collected rock gobies from rock pools in nearby Falmouth. They brought the fish in the lab, carrying them in gray buckets. After they brought them into the lab, they placed them in white or black buckets, and then in red or blue buckets. Within less than a minute, the gobies started to change their skin – they became significantly darker in the black bucket and white in the white bucket. When placed in the red bucket they turned reddish, but when placed in the blue bucket, they turned into a shade of gray rather than blue. Researchers believe that this happens because the color red is important to mimic, as there are plenty of red algae and brown stones to camouflage into, but there are less blue things underwater. The mechanism through which it does it changes colors is fairly simply, but remarkable – when the fish sees that it is placed in a new background pigment-containing cells in the skin, called chromatophores, change the goby’s look. Chromatophores are pigment-containing and light-reflecting organelles in cells found in a wide range of animals including amphibians, fish, reptiles, crustaceans, cephalopods, and bacteria. Birds and mammals on the other hand don’t have chromatophores – they have a class of cells called melanocytes with a similar function.This explains why birds and mammals aren’t able to change colors. 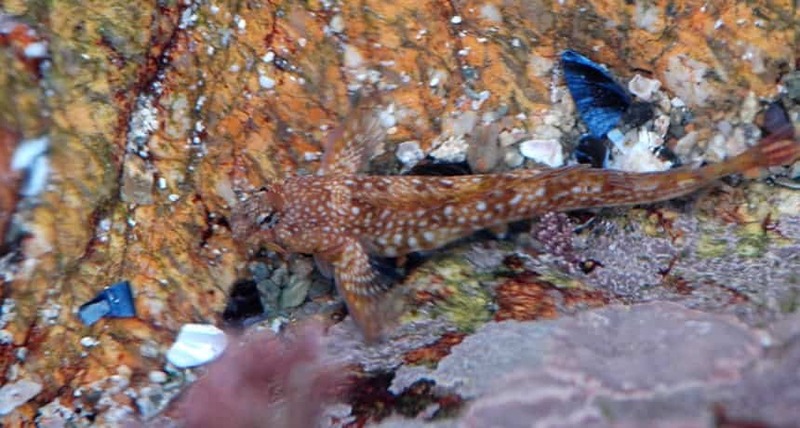 It is believed that rock gobies evolved this way to better camouflage themselves and avoid predators. “Camouflage is found in a wide range of species living in numerous habitat types, offering protection from visually guided predators. This includes many species from the intertidal zone, which must cope with background types diverse in appearance and with multiple predator groups foraging at high and low tide. Many animals are capable of either relatively slow (hours, days, weeks) or rapid (seconds and minutes) colour change in order to better resemble the background against which they are found,” researchers write in their paper.